In the United States, All Hallows Eve (or Halloween) is what we call the holiday that falls on October 31 and is historically associated with the celebration of All Saints and all Souls days. In Mexico this celebration is called the “Dia de los Muertos” or Day of the Dead and in some parts of Latin America is actually called “Dia de los natitas” or Day of the Skulls. Pumpkins (or Jack O’ Lanterns) are probably the most notable symbol of the US holiday, while in Mexico Dia de Muertos is tightly associated with brightly decorated skulls and orange marigold flowers. 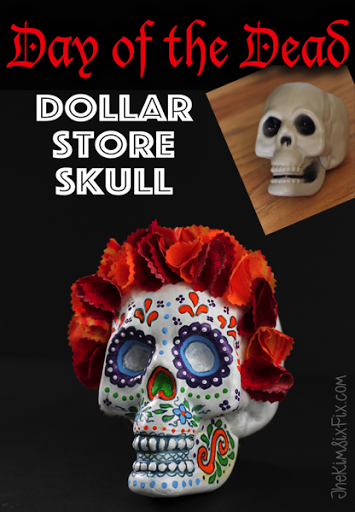 I decided to create my own version of a Day of the Dead skull on behalf of Plaid crafts, Apple Barrel Paints, and Stiffy fabric stiffener** as a fun Halloween alternative. This project is actually super easy and fun, since you get to express yourself completely and it takes nothing more than a little paint (I used Apple Barrel Multi-Surface), some fabric and fabric stiffener (I used Stiffy). You could also use plastic or silk flowers, but it is pretty cool to make my own! It started with this $1 plastic skull I found at the dollar store. Since it was slightly glossy, I knew I could use Apple Barrel’s multi-surface paint since it adheres to almost any surface, plus it is suitable for indoor or outdoor use (and I wasn’t sure where I was going to display my little fellow!) I started by covering the entire thing in two coats of white, and it covered pretty well considering how dark some areas of the skull originally were. To make the pattern really sand I out (and for areas that were too tight to paint) I used a fine tip maker to outline everything. You want to use a soft flexible tipped marker so you don’t scratch the freshly painted surface! I could have used fake marigolds, but I couldn’t find any, and I had a gorgeous collection of hand dyed cottons that I knew would make beautiful flower petals. Then I cut them out with pinking shears to give the ‘ruffled’ look of a marigold petal. I folded the circle into quarters and used a small alligator clip to hold it closed. Next I ‘fluffed’ up the folded circle to create an “S” shape with the fabric inside the fold. **This post was written on behalf of Plaid crafts. I received the products I used plus additional compensation but the ideas, tutorials and images are my own. For my full policy on sponsored content, please see this post.